What Happened in School Today? How frustrating it must be as a parent to have your deaf child come home and have no idea what has just happened to them for the last seven hours. The child may do their best to communicate their day but many of them have JUST learned the vocabulary themselves and reproducing them once they get home for mom and dad is difficult to say the least. One idea that I used that was very successful was a daily journal that consisted of digital pictures of activities that happened throughout the day. I would keep a large piece of white construction paper up on the easel near our calendar area. We would begin writing on it during our daily calendar time. As we went through calendar, we would write the date and the weather on the top of that paper. Then as different activities happened throughout our day, a picture would be printed off and would appear on the paper. The students would then have to assists in adding a caption to the picture describing IN WORDS what the class was doing in the pictures. Besides being a nice way of teaching the concept of summarizing, we had a communication tool that went between home and school. At the end of the day, that large piece of paper was set on the copy machine and reduced in size to about 60 percent. This made the page large enough to still read, yet much small enough to carry home. The students had assisted in the creation of the captions, and now they had a visual aid to help with their retelling of their day. A Signing Savvy addition would be to print 3-5 signs from the day and include them with the paper. This way both the students and their parents would have instant access to these signs and will be able to use them in the discussion of the day's events. What role do the parents have in learning ASL and being able to communicate on a daily basis before this point? Are many parents fluent at ASL? A nice idea might be to start a student blog. At the end of the day, the student could post a picture and write a little bit about their day. The parent could easily log on and see what was written. For the younger kids the teacher could assist. A great site for doing this which allows a teacher to control access to the blogs is wordpress. I like this idea of a Blog from school and will actually recommend it to my teaching staff. It would be a nice way to communicate between home and school, accompanied with a nice color photo...and GREEN! (saving our earth) I like it better and better the more I think about it! thanks! I'm excited that you like the idea. I am a Special Education teacher and have had a classroom blog for a year. I'm not starting up individual blogs for my students for the same reason as you. They are hearing, but also have difficulty communicating with home because they have significant disabilities. If you'd like to see it, my blog is http://dstevenson21.blogspot.com/. Like I said before though, wordpress works better for the students blogs because the teacher can control the comments and passwords. Good Luck! I'm excited that you like the idea. I am a Special Education teacher and have had a classroom blog for a year. I'm now starting up individual blogs for my students for the same reason as you. They are hearing, but also have difficulty communicating with home because they have significant disabilities. If you'd like to see it, my blog is http://dstevenson21.blogspot.com/. Like I said before though, wordpress works better for the students blogs because the teacher can control the comments and passwords. Good Luck! Dramatic play is such an underrated way for children to learn. I had so much fun interacting with my preschool deaf children and watching how they would communicate through dramatic play. It opened the doors for so many teaching/learning opportunities. One of my favorites was making restaurant menus including all the plastic play food we had in our dramatic play kitchens and creating our own cafe. The pages would include a digital photo of the food along with a printed version of the sign and then the price. These were all laminated and bound together with a spiral binder. With this we would play restaurant for hours working on such skills as following directions, using our manners to ask questions and treat people politely, table manners, proper nutrition, even math skills as we added up the bills and made change using a calculator. I seriously had some of my 1st graders making change and even leaving a tip! They never saw this as teaching...they were playing...AND LEARNING! This is a very interesting idea. Very good and more should use this kind of an idea. That's called Home Schooling! I did that with my boys years ago. They loved it. You can do this in the home or the classroom. In many preschool or early childhood classes you walk into the room and you see the written words for different objects around the room everywhere. A chair has the word CHAIR on it, the cupboards are marked with the words PUZZLES, GAMES, PAINT etc... to indicate their contents, all in an effort to teach the children the written words for the different objects from their environment that they interact with everyday. To teach signs, do the same thing! You can leave the written words in place and just add the printed signs from Signing Savvy along side them. You will be amazed at how quickly the students start knowing and using the signs of the objects they interact with daily. I won’t stand for this! You need to stand up please. This flag stands for freedom. In each of these statements the word STAND is used. It is spelled the exact same way, pronounced the exact same way, yet it has VERY different meanings in each of it’s uses above. Now one form of sign language, Signing Exact English, would tell you to sign the word STAND the same in all three sentences because of their 2 out of 3 rule. (If the word is spelled the same and pronounced the same, then you can sign it the same.) Our philosophy here at Signing Savvy, DOES NOT endorse that way of thinking. We feel that signing things conceptually correct is EXTREMELY important! This is one of the big differences between American Sign Language (ASL) and Signed Exact English. With that said….let us look back at the three example sentences listed above. I won’t stand (put up with, or accept) this! You need to stand (to stand up) up please. This flag stands (represents) for freedom. You would want to sign the sentences using the meanings of the words. Those meanings are found in the parenthesis. The sentences that come off the lips would still be using the word STAND but the sign would correspond with the meaning. Just a quick note about the Signing Savvy Phrase Builder - the phrase builder doesn’t have the intelligence to know what the true conceptual meaning of the words you typed in the search box are. It will simply give you the first variation of the sign for the word you entered. However, you can modify the resulting sign video using the tools in the phrase builder (see the video on the phrase builder for details). Please consider this, and make sure your phrases are conceptually correct, when you are using the phrase builder OR translating from English to ASL on your own. Happy Signing! John. I use the flash cards to practice. When I come across a sign that does not match my book, I'd like to be able to add a discription for the word. Right now, I use the fingerspelled form but I have to refer to my book when I come to that word. For example, the word complete can mean entire or all (variant not shown in your dictionary). If I could add a discription that would show with the flash cards, I would know that the word is the same as the sign for 'all'. I looking for a conceptual sign for pollinate. Any suggestions? I hope someone watched last week's NCIS Los Angeles. Abby signed a message to a guy and I couldn't understand the conversation. Did anyone get it? Thanks. Conceptually signing is a must, and it is especially hard in singing songs. I would hate it if folks couldn't understand the true meanings of the songs.... Songs have so many metaphors and adjectives... Websters Thesaurus online is where I go for help. Good luck to all and God bless! Hey I did catch that in the episode..I was watching it and doing other work but from what I caught she asked him how he knew sign language and he said he had a deaf from when he was growing up. Cool huh? That is not the first time they have used sign on that show. Go NCIS!!! My name is John. Yes, I am the guy in the blue shirt shown in the videos on Signing Savvy. Since the launch of the Signing Savvy site last January, I have had several people ask me about my background. I learned to sign at a young age, not because I was deaf, but because I had a deaf neighbor and friend who I wanted to communicate more effectively with. From this point forward, learning to sign and communication issues became a fascination of mine. I began my college education in an interpreter training program but quickly realized my passion was in education. After I graduated from college with a bachelors degree in Deaf Education, I became a teacher of children who were Deaf and Hard of Hearing. After 12 years in the classroom, I was asked by my university mentor to return to the university, pursue a graduate degree, and share my years of experience from the classroom with the next generation of teachers studying in the field. During this time I worked with my mentor on sign language research across the United States and Canada. I earned a Masters in Early Childhood Education. I continue to pursue my doctoral studies in Special Education focussing on literacy issues related to Deafness. After five years of teaching and studying at the university, I returned to public education. In addition to my work with Signing Savvy, I currently work as an administrator and consultant for Deaf Education Programs in a number of school districts. Working with Deaf and Hard of Hearing children was and continues to be extremely rewarding. Happy Signing! When I first started to learn sign language, I was frustrated. Some signs do not make sense, especially if there is not a memory aid shown. Since facial expression and body language is important in communication, why isn't the sign for yes or no not simply a nod of the head? There may be several different signs for the same word, depending on context. I am determined to learn. I'm not deaf but I am hearing impaired and feel that this may be my main method of communicating at some point in time. I'm in a beginning class at a local church and several have already dropped. Yes hang in there. Learn American Sign Language takes the same kind of effort and time as in learning any foreign language such as Japanese or Chinese. Chinese characters often don't make sense to the learner so memorizing and using them often is crucial. I wish i would have started at an earlier age. I'm 19 now and i'm currently attempting to teach myself how to sign. I'm hoping that by 25, i can be fluent! Yes, i agree some signs are very confusing. I have been signing since march 27,2009 when i met a deaf girl at my school, when I first saw her sign I wanted to learn. Since then I have learned so much, but with out her having a cochlear implant I wouldn't have been able to learn as quick, as of right now I could probally sign any word you ask me to. I enjoy signing and have always found it as a very beautiful language. Learning sign language and getting to know her has been wonderful thing to experience. We are currently dating and have been for 7 months, I have fell in love with the deaf culture and enjoy every moment with her. My son was born with a moderate sensorineural bilateral loss, and we are learning sign language to help him communicate as he grows up (he's a year old) I recommend this site to all of the other parents at the school for the deaf, it is my FAVORITE!!! Thank you for creating this great visual -- so much better than trying to decipher a sign on a page in a book. I leave in a town that have maybe 50 deaf folks. So the classes are pretty limited at the community college. Do you have any suggestions where I can go for maybe the Sign III online, not sure if that makes since..., I am still struggling w/Signing. I love signing it is beautiful and wish I could use it more. I am working on an Interpreter Degree, but found out this is not the town to be in since they don't have too much, they did at one time. I really enjoy your link!!! That's great! It's good to know a bit about who you are now. I always did wonder a bit. This website is so useful, and I really do enjoy learning signs from your videos. Thanks a bunch! Wow! You are doing exactly what I'm trying to accomplish. I myself am hearing and learning ASL so that I can become a teacher for Deaf children. I'd love to hear more about your experiance / education / everything! Thank you for sharing your story. Thank you for help us sign. This site must take lots of time and thought for all of you. Thank you so much. thanks so much for this site. i have recently developed a passion for learning to sign. my son has a friend who is deaf and i always felt like there was so more i wanted to say to him and couldn't or struggled to say. my grandson failed hearing tests at birth but now hears. the experience gave me even more motivation to learn. i want to learn to sign hymns and bible verses to better express my love for GOD. this site has been wonderful for me through all of this. thankyou so much. i recently became a member and really am thrilled with the ability to see phrases in their entirety. Yes as in any language there are regional and dialectal differences. If you go to New York there may be signs that are a little different from those used in California or Texas or even parts of Canada. Hello! I am a new signer, taking it for 4 months. I am already taking my test for my pay differential tomorrow! I'm finding it pretty easy but I am determined. I have a tutor 2 times per week and study several hours per day. I too have noticed the dialects and they are quite confusing. If anything the numbers are different and have caused confusion at work. Like the number 16 is interpreted by our deaf community as 60 and our 15 as 50. I have resulted to just "1-6" for all of the teen numbers. My biggest fear is doing a sign that is offensive to our deaf community but appears to be normal on this page. Dialects are rough!!!! Even though there are some changes in dialects that will throw off a sign here or there, remember your audience is looking at the whole picture and will probably not be thrown off by one word that is a little different than what you may have signed. I have never had a deaf person stop me to say they are offended so I wouldn't worry so much about that. They may say later that they would prefer you use this sign in the future ect...and then you just take that feedback and use it. Don't take it personally or get offended. Tutoring from other experienced signers will definitely help. Best of luck to you! 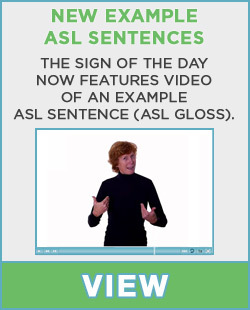 I just have to say that this website has already helped loads with my level three ASL class. It's hard to learn some words in the book ahead of time when you don't even know how they are signed! I crushed my right hand in 1997. By 2006, I became interested to make use of my painful, damaged hand, and began learning ASL on the internet to exercise my hand for pain relief. I drove long trips and would practice signing my A, B, Cs while driving on the highway, trying to "sign sing" with the songs on the radio the best I could. I was slow to learn. Then one week, I was at the Days Inn in NM, and noticed a man who had been in the lobby kitchen area at 2am several mornings in a row. He was using his two fists on the tabletop as his pillow. I tapped him on the shoulder and asked "are you ok? ", he communicated to me without speaking, "I can't hear". I signed "do you need help?, can you sign ASL?". He smiled and began rapidly signing. I grinned and signed "please slow down". We spent the next five hours signing. That conversation was my first using ASL with a another person. He told me his sad story, about, as a Marine in Afghanistan, a bomb went off in the road he was driving on. He was the only survivor in the vehicle. Eight others were killed. He lost his hearing that day. I drove home and was invigorated to know enough ASL to reach someone in need. What a gift I was given by being interested in ASL without lousing my hearing. I found the "Signing Savvy" website and used it as a guest for months. I finally paid for membership for a year, in July 2011. A few Weeks ago, I was invited to attend a Celebration of Holy Mass in a church in Australia. It was obviously the quietest Service I had been to, however, it was the most amazing service that I had EVER participated in. My Sign (ASL) WAS slightly different from the Australian (AusLan). Still we were able to communicate quite well. I was at an advantage that there was an interpreter, who catered for both the hearing and the deaf. She signed when the priest spoke and spoke when someone signed. I am a sign language interpreter at my church. This is a very useful app for our signing team. Every now and then we may get stumped with a vocabulary word. This tool has baled us out on many occasions. Thank you so much! How long did it take to record this massive signing vocabulary on this site? that was such a great story! i am only 12 years old and started learning ASL about 4 months ago, an i already know hundreds of words! your video makes me wnt to keep learning new words, because i think it's great to be able to communicate with a whole new community.